Ex-NYC mayor softens comments to add that president is "a patriot." 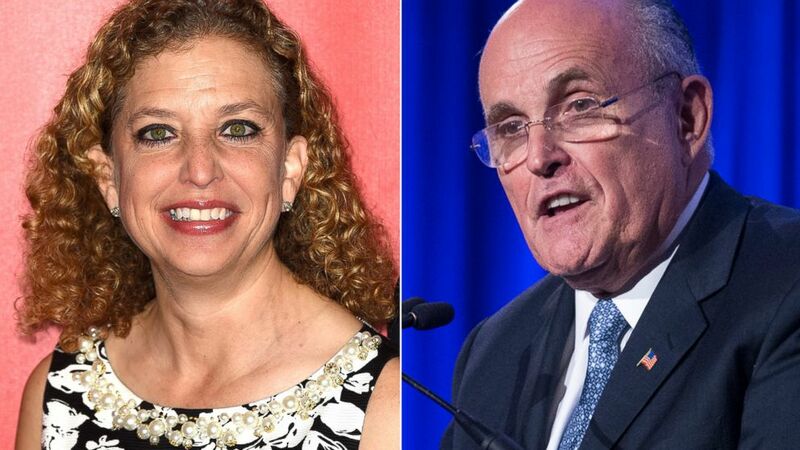 camera (Getty Images | AP Photo) Congresswoman Debbie Wasserman Schultz, left, on Feb. 6, 2015 and Rudy Giuliani, right, is seen in this May 12, 2014 file photo. Giuliani made the comments at a private dinner Wednesday featuring Wisconsin Gov. Scott Walker, a potential 2016 presidential candidate, according to Politico. “One of the GOP frontrunners was sitting just feet away, and didn’t say a word,” the Florida congresswoman said, referring to Walker. Walker appeared on CNBC today, but wouldn’t respond to Giuliani’s comments. “The mayor can speak for himself, I'm not going to comment on what the president thinks or not, he can speak for himself as well,” Walker said. A spokeswoman from Walker’s political operation, “Our American Revival,” declined to comment further, instead referring ABC News to Walker’s comments on CNBC. Giuliani tried to walk back the comments this morning on Fox News, saying he is “not questioning his patriotism,” referring to the president. ABC News' Mark Crudele, John Parkinson and Arlette Saenz contributed to this report.